Telling time just got a lot more fun! Click the pieces together and create an awesome LEGO watch. 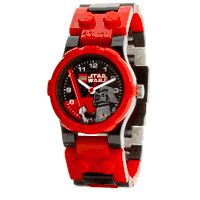 The LEGO Clic-Time Star Wars Darth Vader Watch is water-resistant up to 50 meters and features Japanese Quartz movement. It has a scratch-resistant mineral crystal lens and is nickel and PVC free. Includes 22 tough-wearing LEGO links in assorted colors 2 LEGO stud links 2 interchangeable bezels and a Star Wars Darth Vader minifigure.